A well presented four bedroom, three storey town house situated on the popular Lace Hill development overlooking a green. The property is within walking distance of amenities, Lace Hill Academy and The Royal Latin Grammar School. The accommodation comprises: To the ground floor: Reception hall, cloakroom, kitchen with integrated appliances and a lounge/diner to the rear with Patio Doors leading to the rear garden. To the first floor: Bedroom two, three and four and family bathroom. 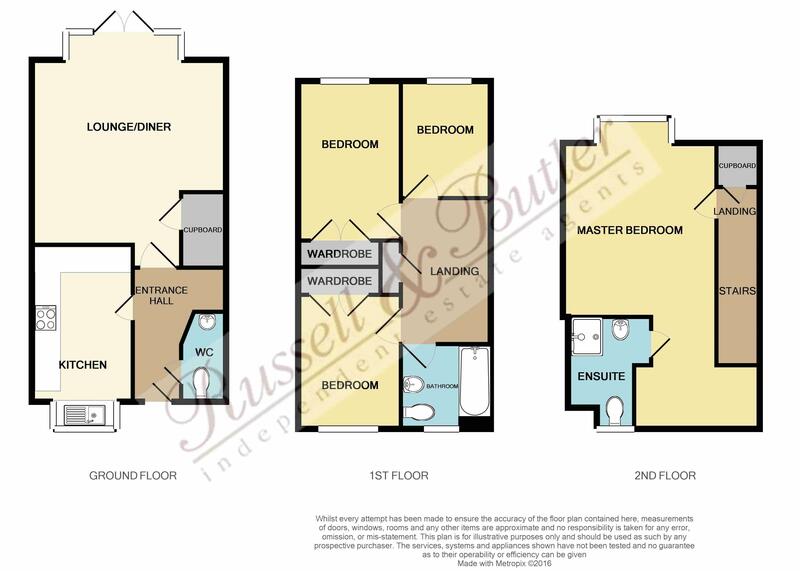 To the second floor: Spacious Master bedroom with ensuite, To the outside: Rear garden, garage and allocated parking space in front of garage. EPC Rating B. White suite of low level wc, pedestal wash hand basin with mixer tap, radiator, ceramic tiled floor, tiling to splash areas. Refitted to comprise 1 1/4 single drainer sink unit with mono block mixer tap, cupboard under, a further range of base and eye level units, rolled edge work surfaces, integrated oven and hob with splashback, extractor hood over, integrated fridge/freezer, integrated washing machine, integrated dishwasher, tiled floor, Upvc double glazed window to front aspect, downlighters, radiator. Radiator, Upvc double glazed French doors to rear garden, Upvc double glazed window to rear, storage cupboard. White suite of panel bath with shower over, full height tiling to bath/shower area, low level wc, pedestal wash hand basin with mixer tap, half height tiling to walls, tiled floor, Upvc double glazed window to front aspect, heated towel rail, shaver point, downlighters. Cupboard housing gas fired boiler serving both domestic hot water and gas to radiator central heating. Upvc double glazed window to rear aspect, access to loft space, radiator (Restricted head room). Fully tiled walk in Shower cubicle, white suite of low level wc, sink with mixer tap, half height tiling to walls, tiled floor, heated towel rail, shaver point, downlighters. Laid to lawn, paved patio area, pathway leading to gate to rear, out side tap. Single garage with up and over door, allocated space in front. Council Tax Band E. All main services connected. No Upper Chain. Restricted Head Room to Top Floor.